As a designer on the Sims 4 team, I really like to set up fun things for people on the team to participate in. The past few years, I've created March Madness brackets within the office so we can have fun voting for the "best" something – we've done top-rated movies (Empire Strikes Back), Disney songs (A Whole New World), and TV show theme songs (Fresh Prince of Bel-Air) – and this inspired us to try to do something with our lovely players and community this year! With that, I'm excited to present a bracket of pack themes reimagined as teams (or, as Lyndsay charmingly portmanteaued – Theams). I hope that you'll join me over the next few weeks in voting for the Best Sims Theam! We'll post a new round of voting every 2 days or so. 32 will enter, 1 will win! I should be clear that this isn't like the community-voted SP; we are not here to pick the next pack the team will make. Some of these themes we've tackled for multiple Sims games. Some we've explored only a bit. Some are ideas we've bounced around but never officially made. All of them are excited Theams vying for the love of the community. As a fellow fan of the Sims, I'm excited to see how it all shakes out, and also jazzed that we all get to do this together. P.S. 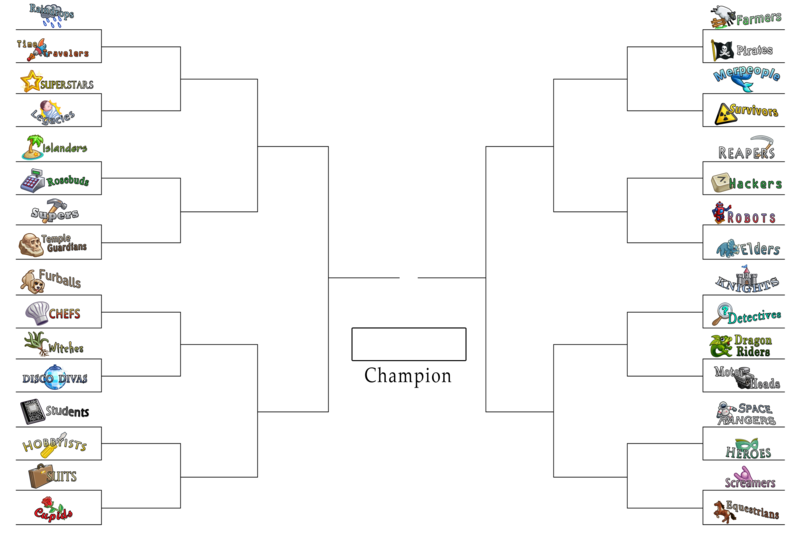 I suppose if you're a big fan of brackets and March Madness and think you know what's going to happen, you could print out a bracket for yourself and fill it in before the voting and see how your predictions line up with the results! OK, enough talk, here's the bracket! Do you want to get to know your theams a little better? 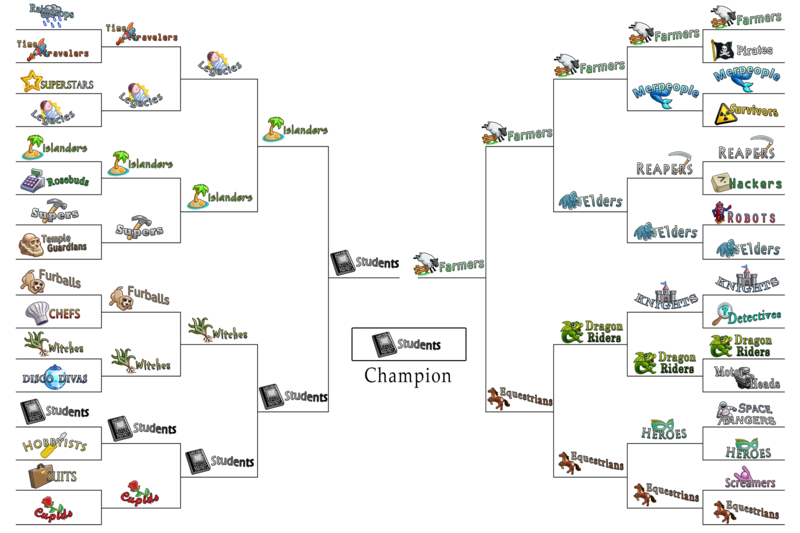 Here are the rallying cries for every theam in the tournament! Let seasonal winds blow, bring the rain and snow! Traveling through time! To the future - sublime! To rising fame! To a household name! Adding lots for babes and tots! Relaxing in style with vacays on the isle. How much is grown with businesses we own! Forge the crown for apartments downtown! Vacations that thrill are what fit the bill! Life can be set once you’ve got a pet! It sure is neat to go out to eat! Potions are baking, it’s magic we’re making! Life starts at night with a party this tight! Head off to college to gain some more knowledge! Come from the jobby to learn a new hobby! Don’t know where to steer? Try a brand new career! Come close, let’s slow dance as we drum up romance! No cause for alarm when you’re down on the farm! The sea holds the fates of thy pirate mates! A new world to explore on the sea floor! The world seemed to die but we still get by! We use all our breath to cheer danger and death! Mess with Sims code? Let’s go down that road! Now here’s a thought: each Sim needs a bot! 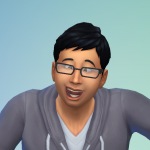 Life only get bolder as your Sim gets older! Ain’t no crimes to love medieval times! A murder with no clue or trace? Not after we have taken the case! A fantasy world awaits with truly fantastical traits! No question Sims are thriving by planing, training, or driving! Explore the reaches of space from a killer star base! The villain cowers against a hero with powers! Full of nothing but pride on a coaster or ride! No other chorces! Only horses and horses! And here's our first voting link, which will be open for about 48 hours from right now! 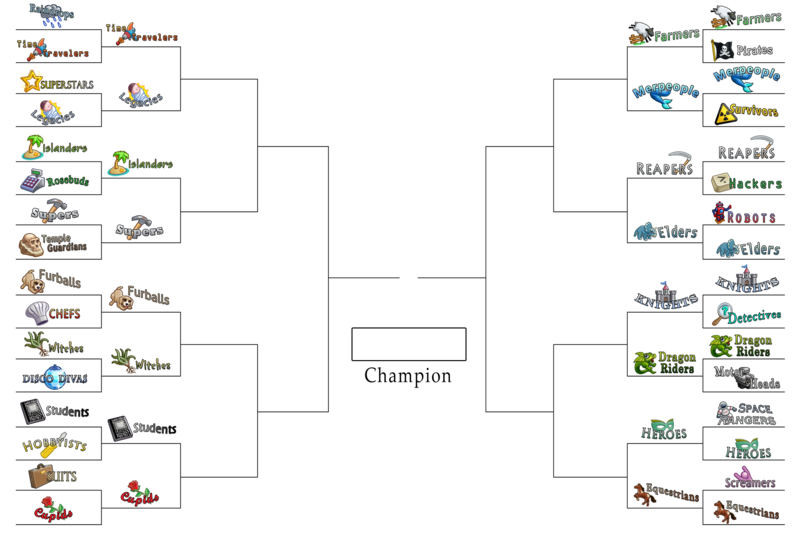 Help vote for who wins the first round in the Western half of our Theam Madness. Whew! One round of voting down! 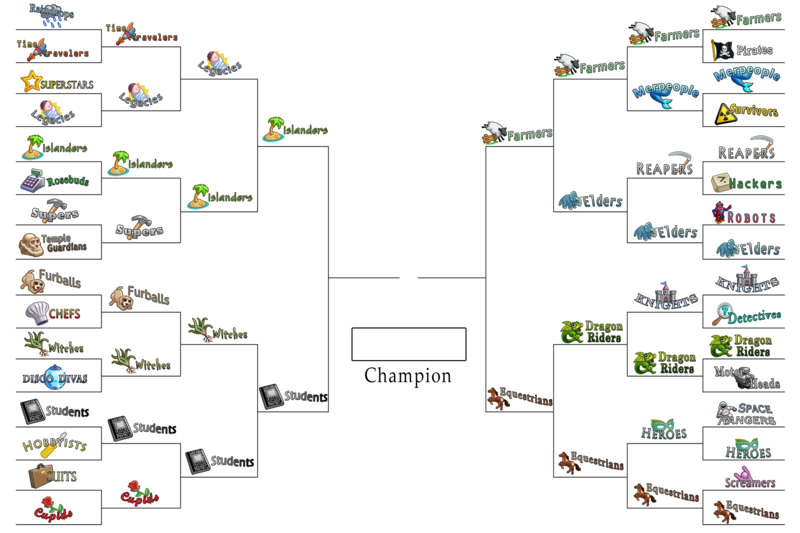 It's time to figure out who wins our first round of voting from the Eastern half of our bracket. The next round of voting is now open and lasts for 48 hours! Congrats to our winners from the Eastern half of the bracket! It's time to move on to our Sweet Sixteen round! Every theam here has a win under their belts. Can they make it to the elite eight? 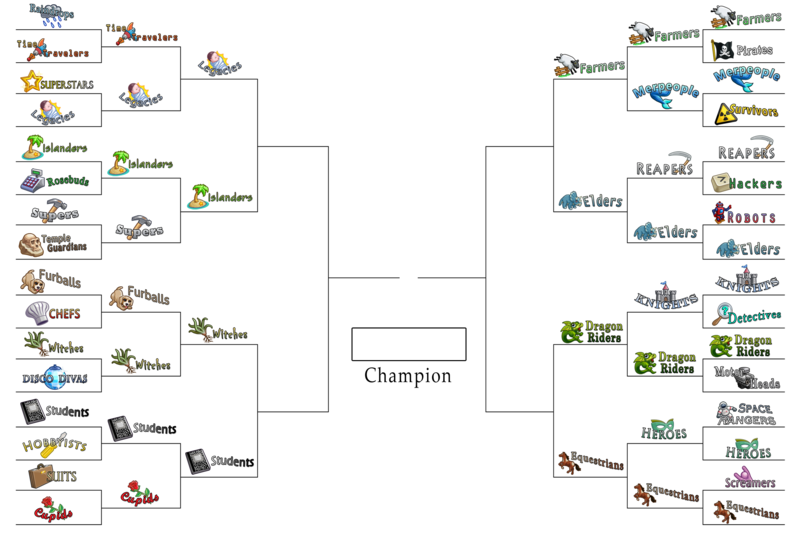 Voting for the sweet sixteen round will go over the weekend and will close in about 72 hours on Monday, 2pm (Pacific). And with that, we are down to 8 theams. The quarterfinals are upon us! Voting will be up for 48 hours and we'll have our final four on Wednesday, around 2pm (Pacific). The next vote is now up and will be for the next 48 hours. See you again on Friday, lovely Simmers, as we find out who will be playing the championship!! We're arrived at our championship matchup! From the Western half: the Students! From the Eastern half: the Farmers! 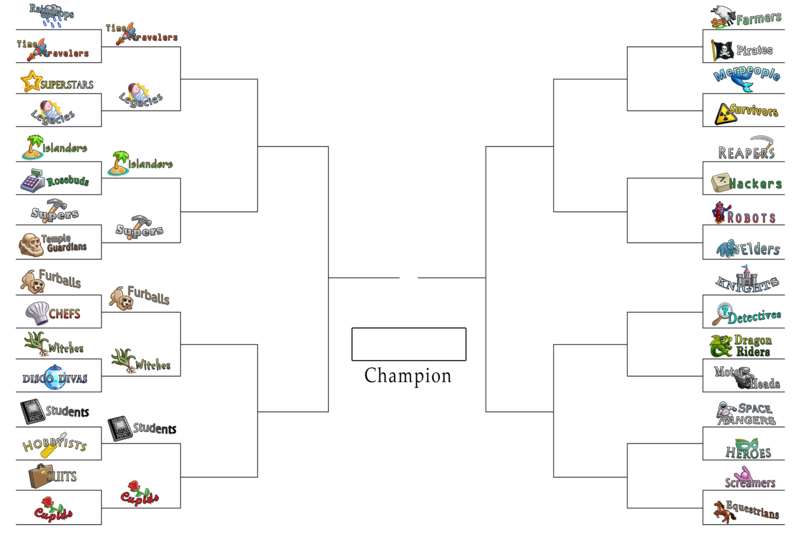 Who will win 2019 Sims Theam Madness?? The next vote is up! Let's wrap this all up on Monday at 5PM (so...75 hours from now) at which point we'll celebrate our winner and all of our competing theams! On a personal note, thanks for everyone who has voted and cared and played. I've been invigorated by your passion! It's all over. The Students take the trophy! 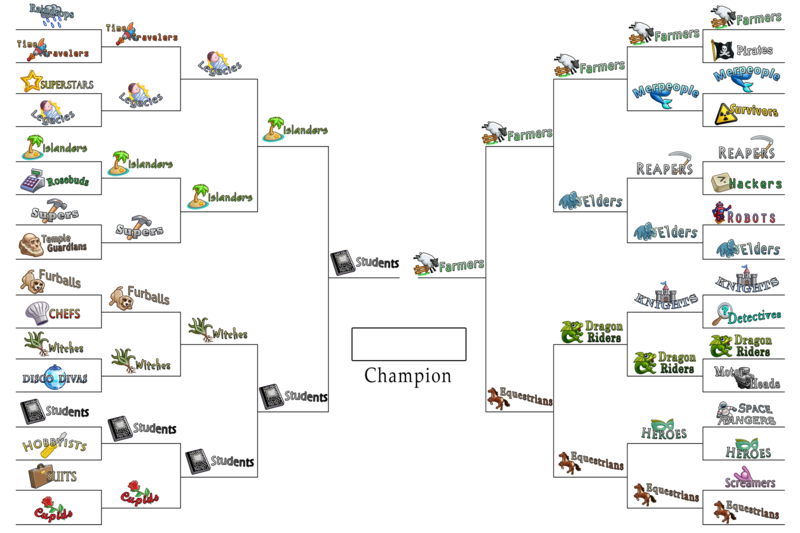 THANK YOU ONE AND ALL (Simmers and the other people who work on the Sims) for indulging these few weeks of bracket madness with a Sims twist. I'm happy to see what people turned out to vote for. I'm happy to see how much y'all care. And remember: if your favorite theam lost, it doesn't mean we don't care about it! One of the things that I love best about the Sims is how we all play differently, how we all like different things, how we all focus on different parts of the game. This game is huge in every way, and I love it and I love you.